In a year dominated by the war in Iraq and the 2008 presidential campaign coverage, how much media attention did immigration receive? Which aspects of the immigration issue did the media most tune into? What was not covered? And who provided the most coverage? As comprehensive news coverage of 2007 from the Pew Research Center’s Project for Excellence in Journalism (PEJ) shows, the war and the presidential election consumed nearly a third of the overall newshole. And the debate over US immigration policy was able to secure itself a position within the top 10 stories of the year. It was the fourth biggest story overall for 2007. American media did not cover immigration as a topic continuously. 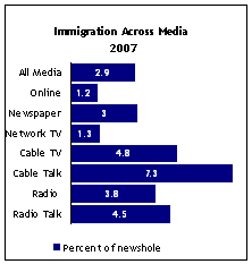 “Media’s tendency to flood the zone with instant coverage and then quickly drop the subject,” as stated in PEJ’s State of the News Media 2008 report, was also seen in immigration coverage. An overall look into all media sectors shows that immigration as a topic in the first four months of the year was below 2%. A sudden surge came in May and June in which the numbers for immigration jumped to 6.1% and 7.6% respectively. And then for the rest of the year it went back to the 2-3% range. The surge in immigration coverage coincided with the May 17 announcement of the compromise bill among the Senate and the White House and its defeat on June 28. Talk hosts both in cable and radio sectors played a major role in the media’s coverage of the immigration bill. For the period of May 17-June 28, immigration policy coverage was highest among conservative radio talk hosts and cable TV talk hosts, with 31% and 18.5% respectively. Some argue that the nation’s talk hosts had an important role in the demise of the immigration bill. As stated in of our earlier weekly index reports “it’s impossible to document how many votes they changed or how many calls and emails they inspired, but derailing the bill certainly was a major priority of such conservative hosts as Rush Limbaugh, Sean Hannity and Michael Savage.” This also showed how immigration as a subject became more political in nature. 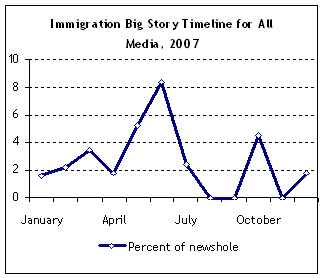 A look into the breakdown of immigration stories in 2007 reiterates the political character of coverage. Fully 54.2% of the newshole of all immigration stories considered in this study were on legislation discussion. The second largest category (27% of the news space studied) was a miscellany of events: such as Immigrations and Customs Enforcement (ICE) raids on illegal immigrants, and a variety of human interest stories, including one about Elvira Arellano, who took refuge in a church in Chicago. With the growing Latino population in the US, some forecast that immigration will become a larger part of presidential campaign debates. But in 2007, during which most of the presidential election coverage was dominated by horserace politics, immigration received only minimal coverage within the campaign. Out of 5,657 presidential campaign stories, only 75 of them related to immigration. nt in the case of immigration coverage as well. While immigration policy coverage skyrocketed in May and June for talk radio and cable, immigration as a topic was consistently present within newspapers signaling an effort to track immigration as a subject that ebbed and flowed throughout the year. 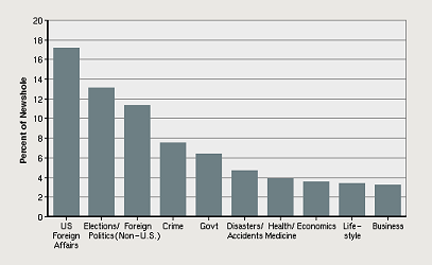 Throughout 2007, the news agenda was dominated by a few major general topic areas. As stated in the State of the News Media 2008 report by PEJ, “coverage of US foreign policy and US politics and elections accounted for almost one-third of the overall newshole for the year.” Immigration as a topic came in after business coverage at 2.8% of the overall newshole. A closer look into the immigration coverage timeline across the year and media reveals how as a topic it was not only covered episodically but also in political terms. 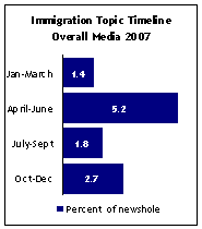 While coverage was pretty much low but steady throughout the year, the spike to 5.2% for the second quarter of 2007 shows how immigration as a topic received more coverage when it was political. 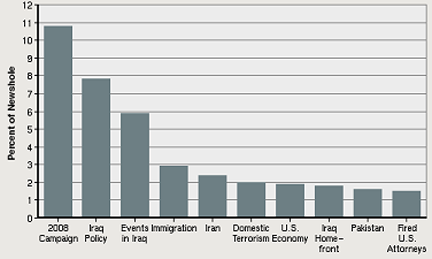 As illustrated in the table below, the year in the news was dominated by two continuing story lines, the presidential election and the Iraq war, they dominated nearly a third of the overall newshole in PEJ’s analysis of news media. Immigration as a top story was at number four with 2.9 %. Yet this number is a bit misleading. A month by month look into the trajectory of immigration as a big story revealed that coverage was marked by episodic spikes, rather than being continuous. A jump in May to 5.3% and in June to 8.4% of the overall newshole for all media demonstrated once again that immigration was not covered as a topic but primarily a politicized subject. The breakdown of the immigration big story also illustrates how coverage mostly centered around the discussion of legislation. While immigration received modest media attention in the first three months of 2007, it emerged in the second quarter of the year to become the biggest domestic policy issue. The debate over US immigration policy, which included an unsuccessful effort to pass a major immigration reform bill in the Senate, was the fourth biggest story overall in the quarter, filling 5.7% of the total newshole. Coverage of immigration during that time increased dramatically in every sector. More specifically, coverage increased sharply between May 17 and June 28 coinciding with the time frame of the birth and death of the Immigration bill. Coverage of immigration across all media was the No.1 topic in the news. With 9.2% of the news space studied for that particular time period, immigration was able to secure first place ahead of the presidential campaign coverage at 8.9%. Let us consider this specific time period in more detail. 1. Newshole is defined as the time or space available in an outlet for news content. 2. For an explanation of the distinction of immigration as a topic and immigration as a big story please refer to the methodology section of this report.